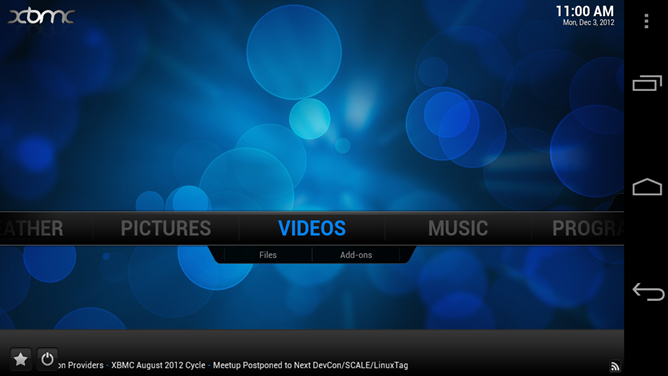 When last we left our heroes XBMC for Android, the group behind the open source multimedia manager had announced that it would be bringing support to the platform soon. Of course "soon" isn't a word that tweakers like to hear, so some enterprising fellows compiled the source code into an APK for your testing pleasure, with all the disclaimers that entails. Today, however, a more official app is being distributed by the team with a hefty 'beta' tag attached. The team also took this opportunity to point out that if your device doesn't support the NEON extension, this app simply won't work for you. Sorry about that! A list of phones and tablets that are supported can be found here. It's also worth noting that this program uses the same TV-centric UI that XBMC is known for. That means that on a phone, you are going to have a heck of a time navigating all those tiny buttons. Touch input and gestures are supported, but everything is designed with the real estate of a television or large monitor in mind. This is probably going to be of the most interest to home theater hackers that really love to set up their multimedia systems just right and would like to incorporate Android devices into the mix. This is not something you want to use to play videos on your phone. Still, if you'd like to try it out, the beta is available via the source link below.